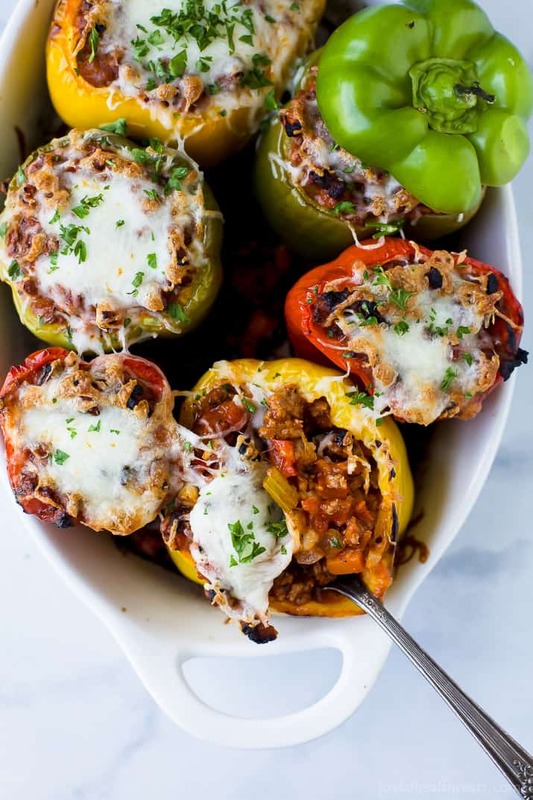 Turkey Bolognese Stuffed Peppers a simple dinner recipe filled with flavor! 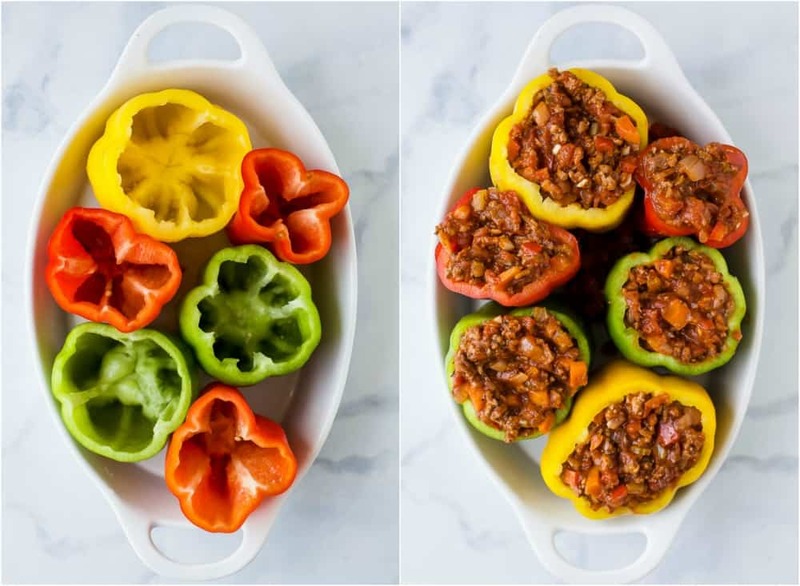 Gluten Free Turkey Bolognese Stuffed Peppers a simple dinner recipe filled with rich flavor your family will love. 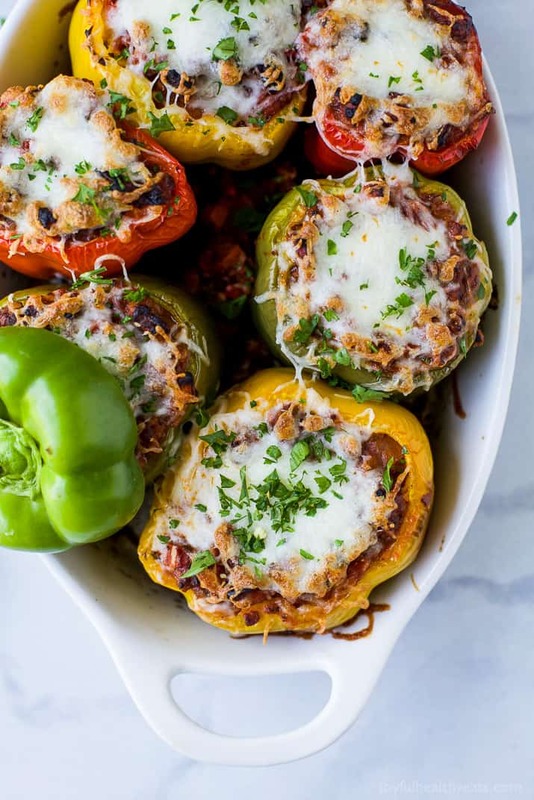 These Stuffed Peppers make the perfect comforting weeknight meal! Normally the name of my game is short and to the point … at least when it comes to food. I usually like to have dinner on the table in 30 minutes or less. But you know what. 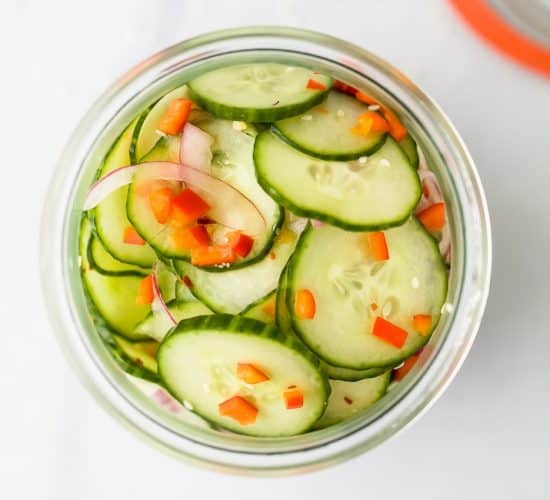 There is something to say about recipes that take that “long and slow” technique. And todays recipe is just that. There’s a lot of love in this dish and you feel it after you take the first bite. 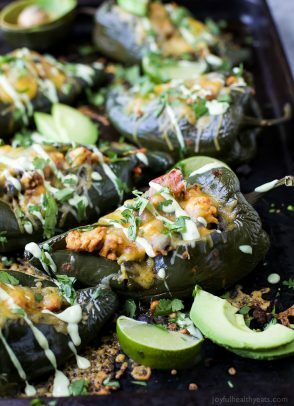 These Stuffed Peppers are utter comfort food to me. They remind me of my mom. She use to make stuffed peppers at least once a week in the winter time when I was growing up. Her’s were done a little different. She use to put rice in the meat mixture to “fill you up” and make the meal go a little longer. She would also par-boil the peppers so there were a little more tender. But now that I’m all grown up, I get to come up with my own recipes and make them just the way I like it. The key to this recipe is the turkey bolognese. What I love about bolognese, is that similar to soups, you can layer lots of different flavors together. 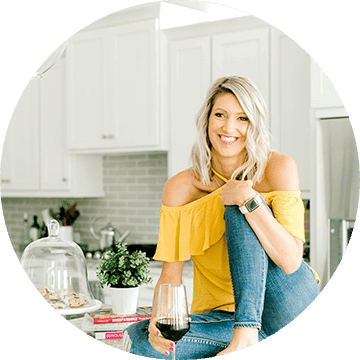 When I was making this recipe I put my apron on and knew that it was going to take a while. But at the end I was going to have one gloriously delicious recipe. I started with the bacon and crisped it up. Instead of adding oil to the pan I left the bacon grease as my “fat” and started to add in my vegetables. Each new vegetable added new flavor. I removed everything from the pan then browned up my turkey and added everything back to the party. Poured in some red wine, herbs, tomato paste (for depth of flavor) and crushed tomatoes. Y’all this sauce is so so SOOOO flavorful! I kept taking spoonfuls of the bolognese while I was stuffing my bell peppers. 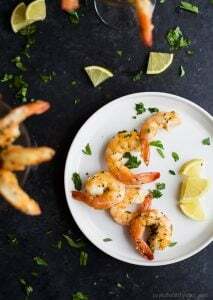 When you can’t stop sneaking bites, that’s when you know it’s a good recipe. And honestly, it only gets better when it cooks longer. Once the bolognese was stuffed into the raw peppers, I then baked them for 25 minutes until the peppers where just starting to get fork tender. But not mushy. There is a fine line. Then I pulled them out, topped each one with a tablespoon of shredded mozzarella and baked them until the cheese melted. 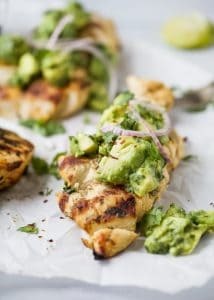 I’m officially obsessed with this recipe. Cason loved them. Mike is not a big stuffed pepper person so I ate three all by myself! And no, not all in one sitting. Although I could have. They are absolutely divine. 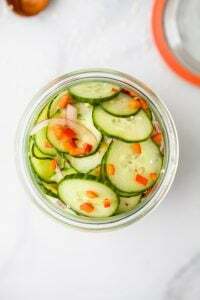 It’s the perfect simple dinner recipe as we head into the fall or school year. 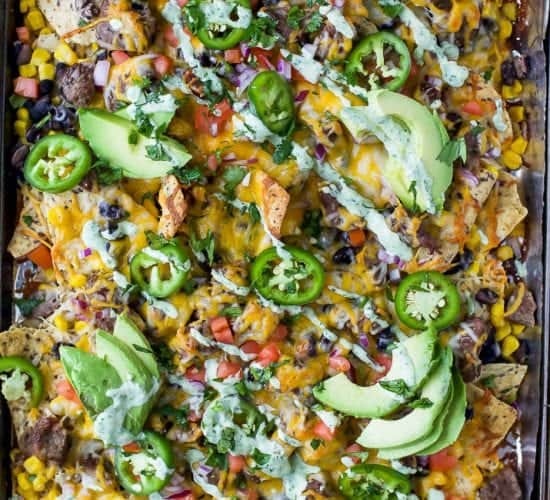 It can easily be made ahead and then thrown in the oven right before dinner time. 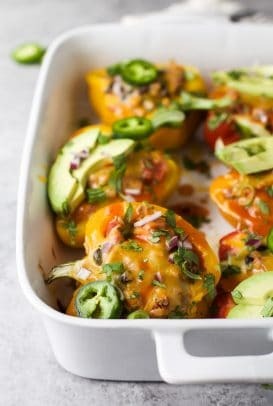 These peppers are less than 300 calories, low carb and have 23 grams of protein per serving. But most of all they are bursting with deep flavor! To a large skillet add bacon. Saute until bacon is browned and crispy. Using a slotted spoon. Scoop the bacon out and place on a paper towel lined plate. Leave the bacon grease in the pan. To the pan, add diced onion. Saute until translucent, about 2-3 minutes. Next add in garlic and saute until fragrant, about 30 seconds. Then add in celery, red pepper and carrots. Saute 4-5 minutes. Stirring throughout. Remove the vegetables from the pan. Place in a medium bowl. Place skillet back on the burner and add ground turkey to the pan. Cook until the turkey is slightly browned, about 5-6 minutes. Make sure to break the turkey up so it is not clumped together. 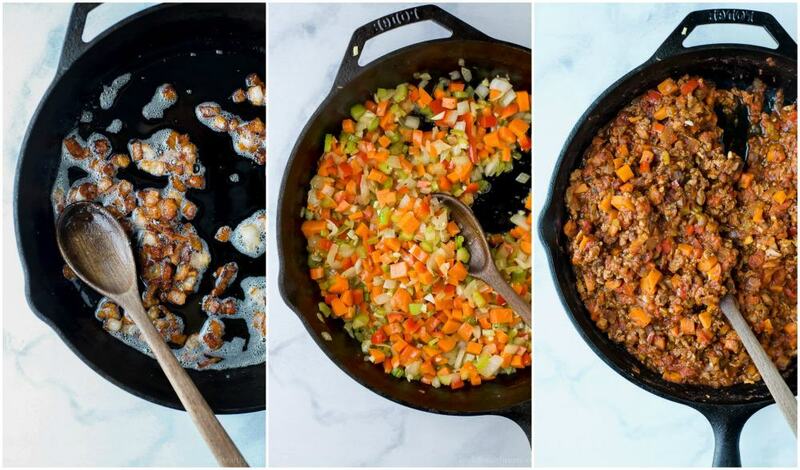 Add vegetables and bacon back to the pan. Stir and add in the red wine. Cook for 1-2 minutes, until the alcohol is cooked out. Then add in tomato paste, basil, parsley, oregano and salt to taste. Stir everything in until you can no longer see the tomato paste. Then add in the crushed tomatoes. Stir and bring to simmer. Let the mixture simmer for 5 minutes or until a majority of the liquid is evaporated. Stirring throughout. 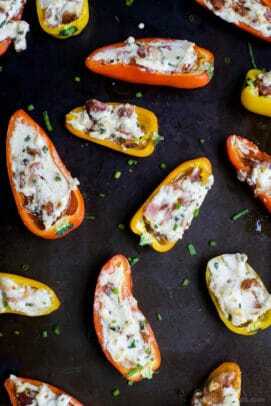 To an 8×8 baking dish add 6 whole peppers. Stuff each pepper with the turkey bolognese mixture. 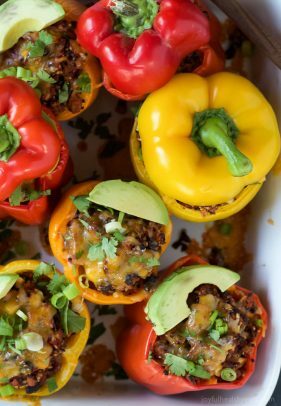 Place in oven and bake for 25 minutes, until the peppers are just starting to get tender. 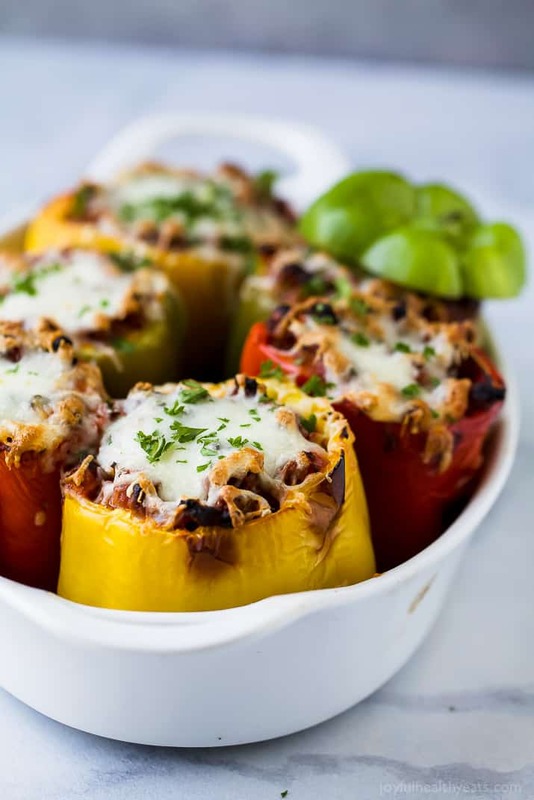 Want More Stuffed Pepper Recipes? I seriously think I’m in love with these peppers! 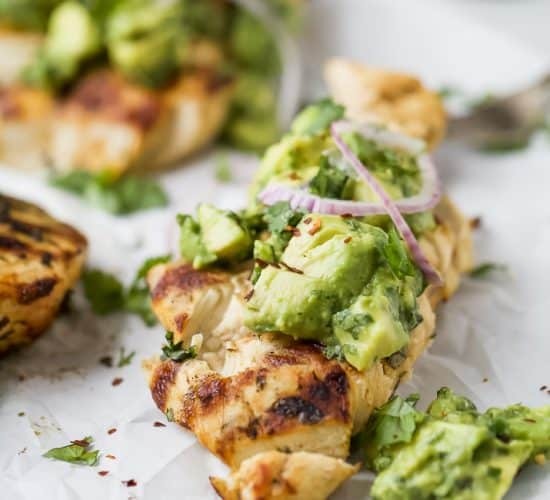 This is such a great appetizer! I adore this! And I’m with you on the “fine line” of too mushy! 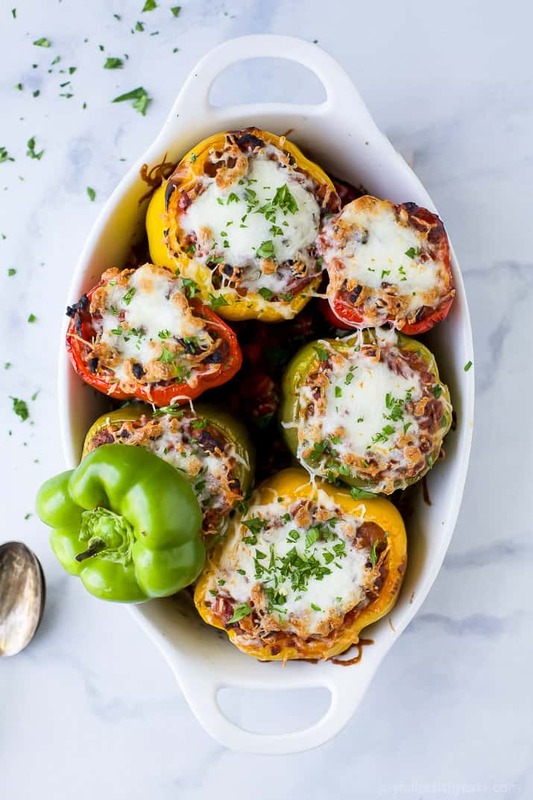 Your mom’s stuffed peppers sound like my mom’s – a classic! 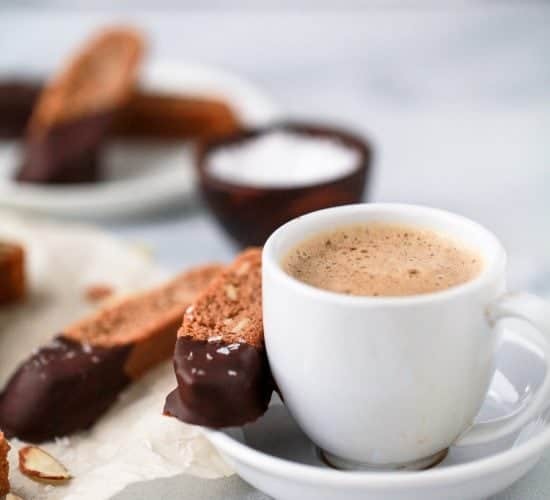 I like to add my own twist, too, and this is such a delicious idea – just love it! 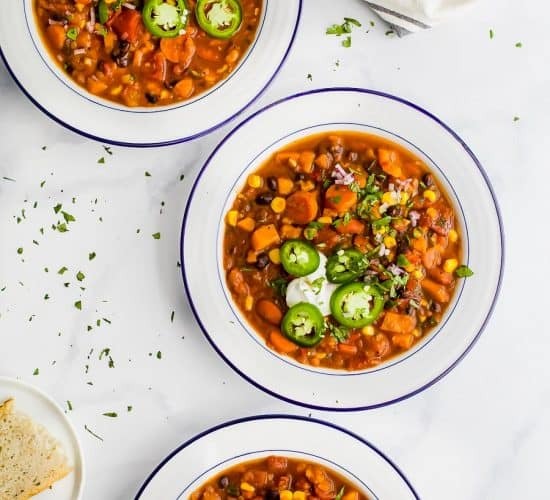 Comfort food dinner that’s so easy to make! Totally a win-win! 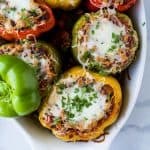 My family will love these stuffed peppers! So tasty looking! My husband will love this dish! Looks fantastic! 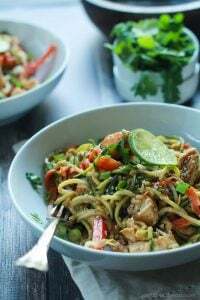 This will be a sure hit for dinner any night of the week!